A majority of software developers take pride in the software they code. Put them in a support job function and they seem lost and highly disinterested. They believe, it is in their genes to code and a support job would be menial and below their dignity. This is particularly true in emerging countries, where a call centre employee would be looked down upon by someone in an IT/software job and even an IT networking job function for that matter. After all, they earn probably double the salary or more and enjoy more prestige in the society. Well consider this. The thing that software developers should hate the most is that they rarely communicated with the end users, the ones who actually use their application. The developers are given a list of requirements, stated what is expected and that is it. In the end, they never find out whether their work meets the requirements of the actual end users. They also never get a chance to find out from the end users about how to improve the application or get an honest feedback albeit appreciation on the work. What is the whole point of writing software? It is to develop something useful that adds value to the life of some or many. A ‘we make, you take’ approach leaves the customers ignored and passive. If you do not communicate with the people who use your output, you are losing out on an overall learning or growth opportunity. Sadly, many developers take a negative approach and do not indulge in anything that distracts them from the love of their life – coding. However, side-stepping support totally is a big blunder. Many organizations do a good job of listening to their customers. But a gap exists because only the sales team is involved and the developers are not involved. These developers are the very people who actually make the end product and their insight would be invaluable. Well, how do you involve the developers? Take the example of Automattic, the company behind the famous content management system – WordPress. Every new hire that joins Automattic, initially finishes three weeks of support before moving on to coding or any other role. The three weeks support role is mandatory for everyone irrespective of the role in which they are joining. Why so? It forces the developer or the new hire to see software through the customers’ eyes. By directly communicating with the actual users of the software, the company can find out what the problems are in the software and what one can do to streamline it. The company recognizes that their software and services are not perfect. In fact, they have job positions titled – ‘Happiness Engineers’. They believe when things go wrong people are not wary about asking for help. 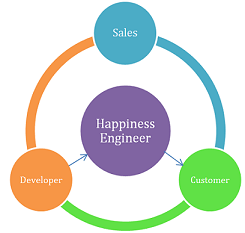 Happiness Engineers help those people and it is their passion to make products more understandable to the people who use them and more importantly to the company. A developer in that role can do wonders.